We are a small family run baby products company specialising in teething products. Our core focus has always been Mom and Baby. We always use the finest quality materials in manufacturing and test all of our products with our own children. We are so confident in our products, that we are offering you a 60 DAY MONEYBACK GUARANTEE. You are guaranteed a positive experience! VIBRANT DESIGN - Your Educational Toys come in a set of 4 BRIGHT COLOURS of Green, Yellow, Pink, and Blue. Designed to stimulate your babies' senses & are great for boys, girls, or as even as a gift. 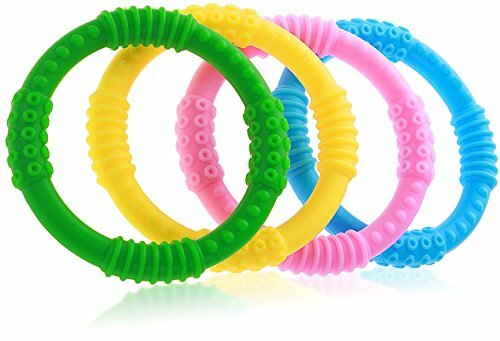 Unlike Sophie the Giraffe or the Nuby Teether, the Bracelet shape allows you to wear them on your wrist so you or your baby won't lose them. Made from 100% SILICONE and are Dishwasher-safe. Makes a great Baby Shower Gift! If you have any questions about this product by Bonbino, contact us by completing and submitting the form below. If you are looking for a specif part number, please include it with your message.